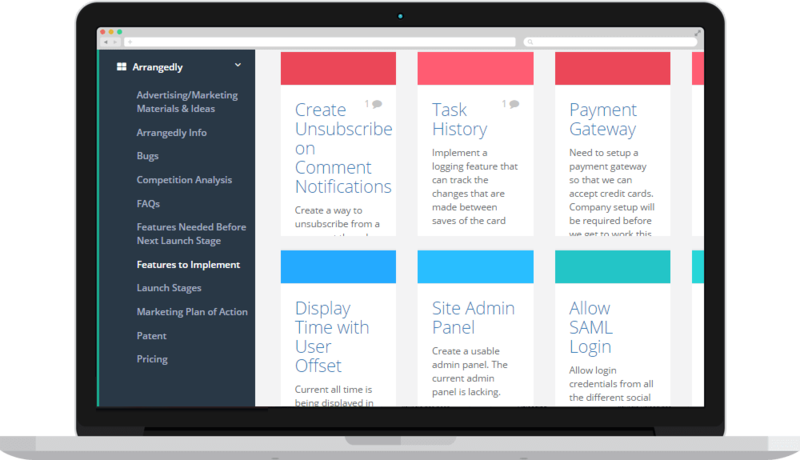 Arrangedly's task cards allow you to organize and prioritize your projects with ease. Why All the Fuss About Arrangedly? Can It Really By Learned By Anyone In Just Two Minutes? 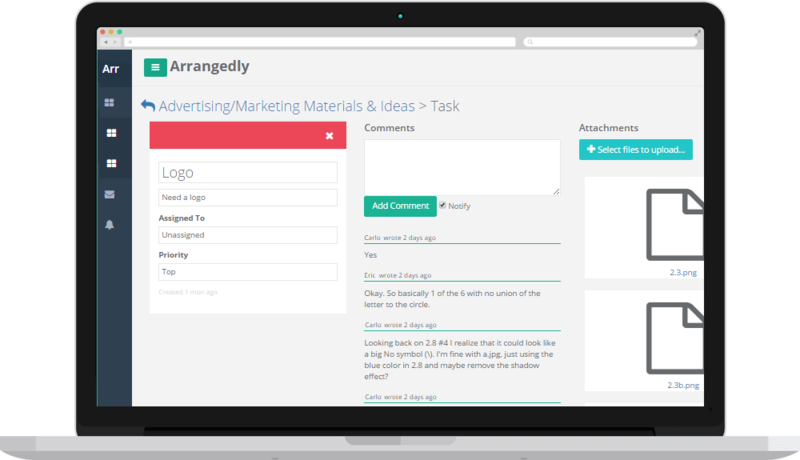 Arrangedly was built to be the most simple collaboration tool possible. If you or any members of your team aren't the most technically fluent people in the world, have no fear! Take work on the go and move the constant juggle of meetings, calls, text, and video chats, into a seamless and simple dashboard for collaboration. Everything work related organized, arranged, completed, and stored in a single place. 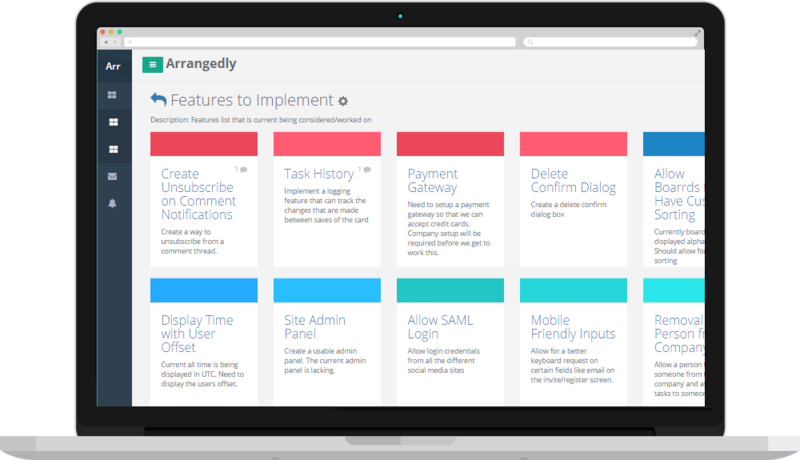 Whether it be a two member partnership or a two thousand member organization, Arrangedly simplifies workflow. Create boards that speak to the general needs of your business. These can be based on categories of work, or, if you simply want to manage the workflow of members of your organization, these boards can be named after individuals or teams. Boards can be deleted if the category of work is no longer necessary to manage. Tasks are created within boards in order to make sense of the work that needs to be done. Tasks can be assigned to individuals or left unassigned. Correspondence within tasks is as simple as texting. Members of tasks will receive email alerts (should they opt) highlighting any updates to tasks. Tasks can be archived once completed. Our color coded task board allows for the simple arrangement of tasks. If a hierarchy of task importance exists within a board, arrange the tasks accordingly. Sub levels of importance can be created to help with the order of operations. If a hierarchy does not exist, the colors can be seen as simply an aesthetic pleasing to the users' eyes. Tasks, once completed, can be archived for reference. Archives offer data for accountability, process iteration, and organizational self learning. Yes, it is simple; and yes, it can be learned by anyone in minutes! Ready to See if Arrangedly Works for You? © 2017 Arrangedly. All rights reserved.